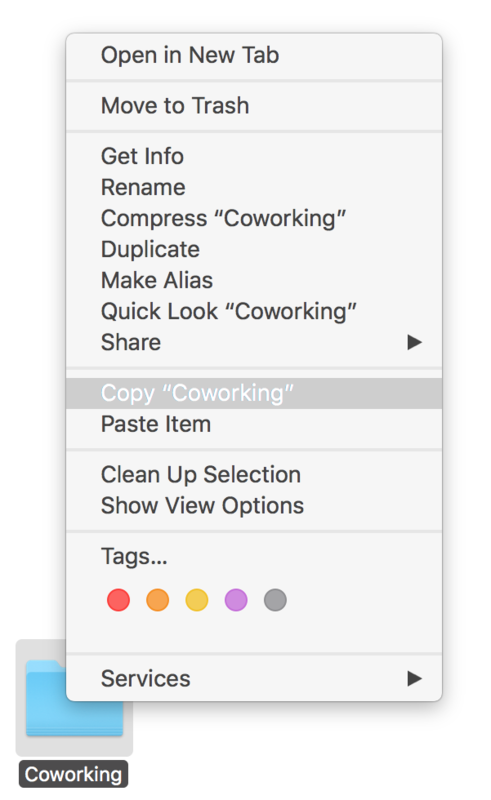 How to save tags and comments that you created on your Mac? 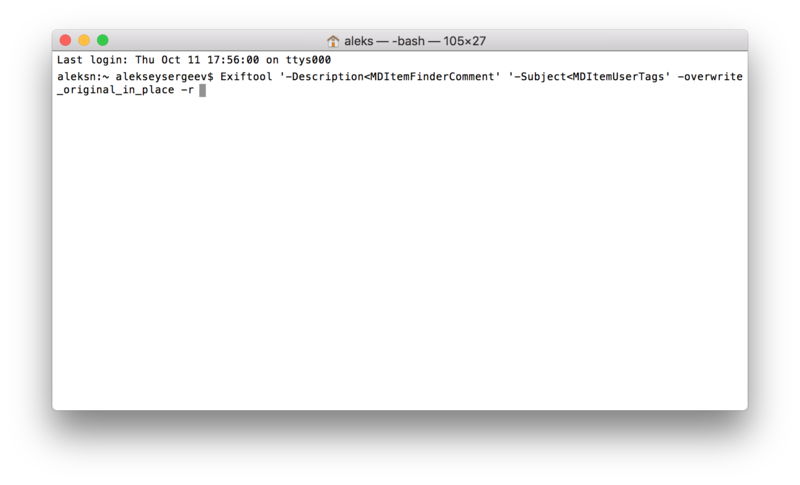 MacOS users benefit a lot from tags and comments. You can attach them to various assets and use them to better organize and search your files on the computer. Unfortunately, MacOS does not save your tags and comments into the file's metadata. It means that if you want to send this file to somebody via email or google drive, your tags and comments will be lost. However, there is a solution how to save your tags and comments in the file’s metadata, i.e. to make them visible beyond MacOS, including Pics.io. 1. Install ExifTool on your computer. You should install ExifTool only once. Next time when you want to migrate MasOS assets, you just skip this step. 2. Open Spotlight Search on your Mac. One way to open it is to click on the magnifying glass in the top right corner of the screen. 3. Type the word terminal into the search window. 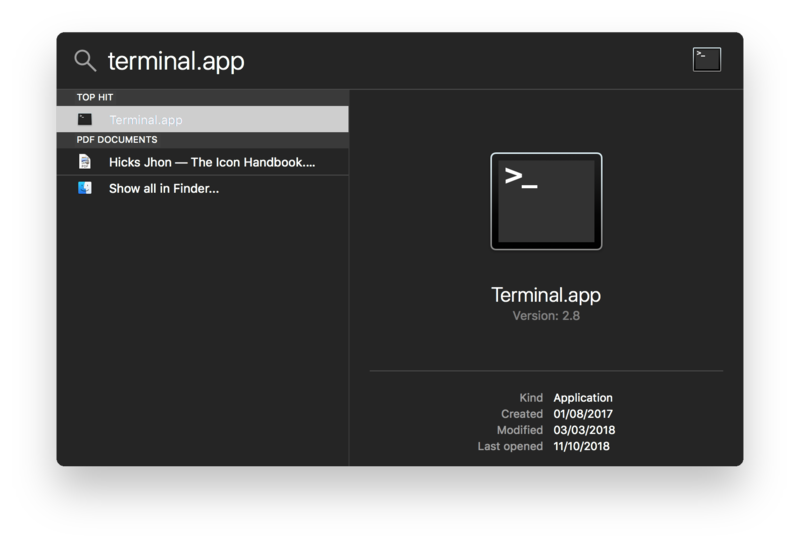 Then press Return or double-click the Terminal application icon on the appeared list. 4. Copy and paste the following command into the terminal window that will open. Do not press Enter. 5. Do not close the terminal window. Open Finder and choose a folder that you want to upload to Pics.io. 6. Copy the path to this folder. 7. Paste the copied path into the terminal window. Make sure you leave one space after the exiftool command. 8. Press Enter and close the terminal window. Now your folder is ready to be uploaded to Pics.io. NB Please note that if you later make some changes to this folder (e.g. add a new comment), you need to perform the whole procedure once again, starting from point 2, before you upload assets to Pics.io. Where can I find my MacOS tags and comments in Pics.io? Tags will be saved as keywords. You can find them in the Infopanel. Comments will be saved in the description section. You can also find it in the Infopanel. Is it possible to save my color tags from MacOS as color labels in Pics.io? Select all the files with the necessary keyword in Pics.io (e.g. keyword “green”). Attach the corresponding green label in the Asset marks section in the Infopanel. The selected files will all be marked with the color label you attached.